This website and listing is offered as a service to the community. 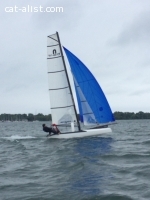 You can post your multihulls that are for sale, wanted, and parts. Take some time to look at the other ads to get a feel of the information that people will need to know. For an ad to work, the price must be listed, and location as potential buyers will be thinking of shipping or transportation in their planning. Once an item is sold and the listing is no longer needed, please delete it, or ask me to delete it, this will keep the listing CLEAN. To post and ad, you must login. Click on login in the top right, then enter your userid and password. If you don't already have a userid and password, you can create one, by clicking on Don't have an account? on the login page.